Should I See a Doctor About My Cut or Scrape? Should you see a doctor about your cut or scrape? Maybe you tripped over your 4-year-old's LEGO castle and cut yourself as you fell. Or perhaps that thumbtack you stepped on looked dirty and you can't remember when you last had a tetanus shot. How do you know when it's time to seek professional medical care? The shape of the wound is jagged. The injury is located on your face. The edges of the wound are gaping open. The injured area contains embedded dirt. Blood is spurting out or the bleeding won't stop after 10 minutes of direct pressure. It's been 5 years or more since you've had a tetanus shot. After examining the wound, your doctor may clean it and prescribe oral antibiotics. He or she will also determine whether or not you need stitches to help the wound heal faster and leave less of a visible scar. Stitches on the face are usually removed after 3 days. In high-stress parts of the body, like elbows, stitches can stay in for up to 14 days. 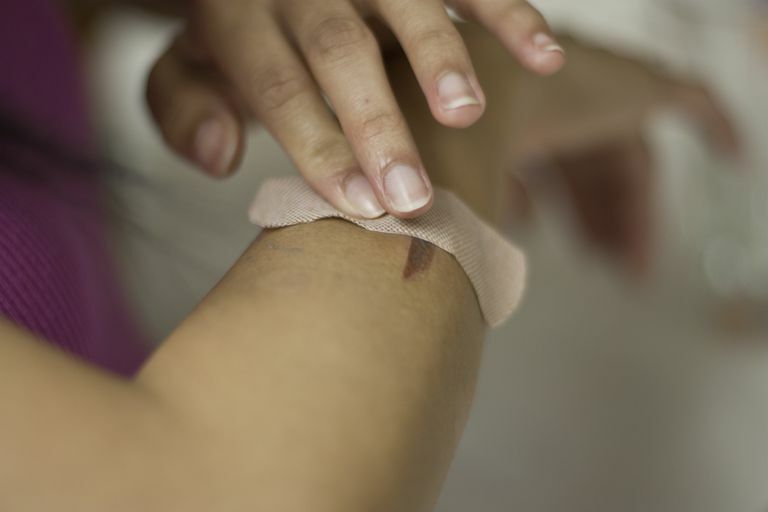 Alternatives to stitches include adhesive tape, staples, or liquid skin adhesives that work like glue. Liquid adhesives don't need to be removed. If you didn't receive a three-shot series for tetanus, also known as lockjaw, as a child—or if you haven't had a booster shot within the past 10 years—now's the time to get caught up, either with that three-shot series or the booster. For maximum effectiveness, shots should be given within 1 to 3 days of an injury. If your wound is serious, your doctor may recommend a booster even if you've had one between 5 and 10 years ago. However, getting a tetanus shot more frequently than every 5 years could result in an allergy to the vaccine, and the vaccine might no longer protect you. While many people believe it's the rust on an object that leads to tetanus, it's actually the dirt that carries most of the risk. If you notice any of these symptoms, but can't schedule a doctor's appointment that day, you should go to the emergency room. "Cuts, Scrapes, and Stitches: Caring for Wounds." familydoctor.org. Dec. 2006. American Academy of Family Physicians. 12 Feb. 2009 . Porter, Sandy J. "Sutures." stvincent.org. 2006. St. Vincent's Indianapolis Hospital. 12 Feb. 2009 . "Tetanus." nlm.nih.gov. 17 Jun. 2008. National Institutes of Health. 12 Feb. 2009 . "Tetanus Vaccine." med.umich.edu. 7 Nov. 2005. University of Michigan. 12 Feb. 2009 . "Wound (Skin) Infection." med.umich.edu. 2 Mar. 2006. University of Michigan. 24 Feb. 2009 .